Preferred Hotel Group is a collection of over 800 independently owned hotels and resorts in over 70 countries across the globe. For bookings and stays throughout 2014, you get a 10% promo code plus free breakfast, when you pay with any Visa credit card. For example, a superior twin room at the 5-star Hotel Metropole in Brussels, Belgium has a price of €112 for the night of 8 March 2014 (breakfast included). The same room costs 162€ from booking.com. 10% Expedia.co.uk voucher code for hotel bookings worldwide, for travel until 31 March 2015. We are listing the Park, Sleep and Fly hotel packages at the Brussels National Airport in Zeventem in the ascending orders of price, as we found them for a night's stay on the 15th of March 2014. Please note that most hotels require you to present a flight ticket / boarding pass / holiday package to benefit from these rates in Brussels. Read the terms and conditions before booking. Swiss Air Lines offers the possibility of purchasing a 300€ voucher by paying only 245€, thus resulting in a 55€ discount. 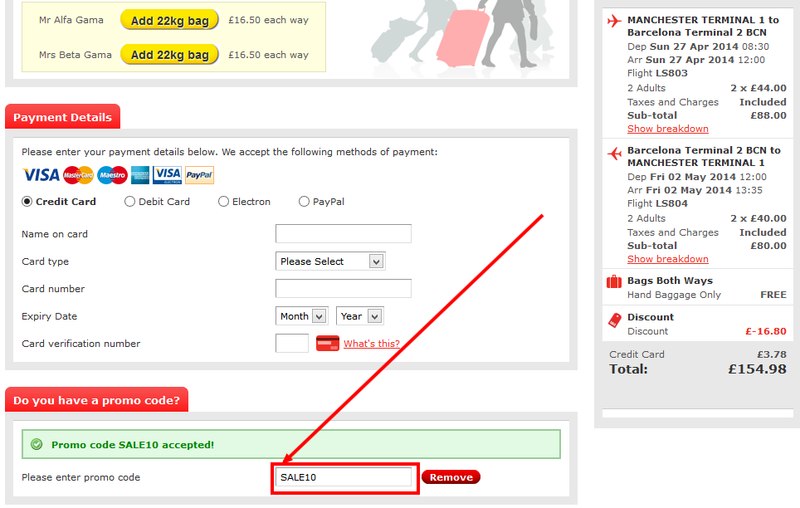 The voucher can then be used when you purchase a flight ticket, at the bottom of the "Options" page a section «Voucher redemption» is shown. Click on «see choices» and enter your voucher code. The ticket must be purchased until 2 June 2014 and travel must take place until 31 March 2015. The voucher is valid on flights departing from Italy, Spain, Germany, Austria, Romania, Serbia, France, the Netherlands, Belgium, Luxembourg, Greece, Portugal, Turkey and Ireland to any destination of the SWISS (LX) network. Codeshare flights are excluded. Only one voucher per person per booking can be used (so if several people travel, purchase separate vouchers and make separate bookings for each). Any unused portion of the voucher is lost, so it is useful only for bookings of minimum 300€. Temptation Resort and Spa Cancun is an adults-only, all-inclusive resort, with a sensual touch. For stays until 25 December 2014, they offer a 40% discount off all stays. - the 4th night for free for bookings until 28 April 2014 and stays between 1 July 2014 and 25 December 2014. This is an unique opportunity to get a significant discount at this type of property which usually sells for more than 400$ a day. Hyatt offers a 15% discount off the flexible daily rate at the Regency Orlado, Florinda, for stays of 3 nights. The current Orbitz coupon code is valid for stays worldwide until 30 June 2014. The Orbitz discount code must be typed in the field "Promotion code" on the payment page, just above the credit card information. jet2.com is a low-cost carrier offering flights from 8 UK airports (Leeds Bradford, Belfast International, Blackpool, East Midlands, Edinburgh, Glasgow, Manchester and Newcastle). They are currently offering a 10% voucher code valid on the total airfare. We are listing the Park, Sleep and Fly hotel packages at Frankfurt am Main International Airport / Flughafen in the ascending orders of price, as we found them for a night's stay on the 15th of March 2014. We are listing the Park, Sleep and Fly hotel packages at CDG Paris Airport in the ascending orders of price, as we found them for a night's stay on the 4th of January 2016. 10% Zuji Australia discount code for hotel bookings worldwide (150$ minimum spend, travel throughout 2014). Save 10% on hotels worldwide - use coupon code: OI!OI!OI! The discount code is to be applied in the final page of the reservation process, in the field "Promo code", just above the credit card information. This is the first of a series of articles on the best Park, Sleep, Fly hotel packages. We start with Milan's largest airport. We arranged the hotels in the ascending orders of price, as we found them for a night's stay on the 4th of January 2016. 25% CheapTickets.com promo code for hotel stays until 30 June 2014 in Las Vegas. The CheapTickets coupon code is to be applied on top of the payment page, in the section "Promotion code", just above the credit card information. The offer is valid for bookings until 23 January 2014, for stays until 31 March 2014. For example, a Deluxe Garden King at the Conrad Bali has a total price of 702$ for 4 nights (13 - 17 February 2014), taxes and service charges included. The rates are non-refundable, so book only if you are sure of your itinerary. Expedia offers a 100$ promo code for flight + hotels package bookings until March 23, 2014 and travel until December 31, 2014. The Expedia discount code is valid for purchases of minimum 1 000$ (thus giving up to 10% discount). A minimum of 4 consecutive hotel nights is required. The Expedia coupon code needs to be typed in the section "Enter a coupon or promotion code", in the payment window, just above the credit card information. Priceline´s Express Deals are unnamed hotels offered at a discounted price, whose names will only be shown after the purchase (very much like Hotwire or lastminute.com Top Secret Hotels). There is no need for bidding with these hotels, as opposed to the Name Your Own Price deals. However, the Express Deals are a pretty good indicator of what you can get after a successful bid. We are currently trying to give you some indications what could those Express Deals be so that you are aware before making a purchase. Guest Score: Rated 7.0 out of 10 (or higher). Let's reveal those Express Deals together: if you booked such a hotel, leave a comment to share the description before the purchase and the actual name of the hotel. Before proceeding with any hotel reservation for Hyatt properties, it is advisable to see if you qualify for their Best Rate Guarantee. This means that if you find a cheaper rate elsewhere prior to or within 24 hours from booking directly with Hyatt, they will give you the room at 20% discount compared to the cheaper rate..
For example: the room costs 100$ on Hyatt´s website, you find it at 80$ on another website (e.g. Orbitz), then the final cost for your room will be 64$ (being the 80$ for the room minus the 20% additional discount). It might not always work, as sometimes there are no cheaper rates elsewhere, but it is worth trying. - opaque providers of hotel rooms, such as Priceline.com and Hotwire.com, that do not reveal the hotel brand name until after you have pre-paid your hotel room do not qualify for the guarantee. Do not make the reservation yet, just write down the preferred room and rate. Note the web address of the travel agency and the amount of cheaper rate found - the "Comparison rate". Do NOT make any reservation on that website, as the final purpose is to make a discounted reservation through the Hyatt official website. Note down the reservation number, as you will need it for the claim (in step 4). Prior to or within 24 hours from the Hyatt reservation, fill in this claim form. You should get a reply within 24 hours of making the claim. If you cannot find a cheaper rate elsewhere, write us an e-mail at hotelsrooms@yahoo.com and we will try to help you. Leave a comment at the end of this article to share your experience in claiming the Hyatt´s Best Rate Guarantee. The offer, including free breakfast, is valid at the Hotel Ork*** in Hveragerdi, about 40 km from the capital Reykjavik. The hotel has an outdoor heated pool, a waterslide and a geo-thermal sauna. To get the best discount, book a holiday of minimum 3 nights. For example, 3 nights during the period 21 - 24 February 2014 have a total price of € 137. The same room is sold at a total of € 245 by hotels.com. Tropicana Las Vegas**** has recently become part of the DoubleTree by Hilton Hotel chain. For bookings until 31 January 2014 they offer a 15% off the flexible rate. Stays from 9 March 2014 until 1 May 2014. The discount will be automatically applied, no need to manually type in a discount code. 50 Australian Dollars discount code from Zuji Australia for hotel bookings in Dubai (minimum 400 AUD spend, travel throughout 2014). 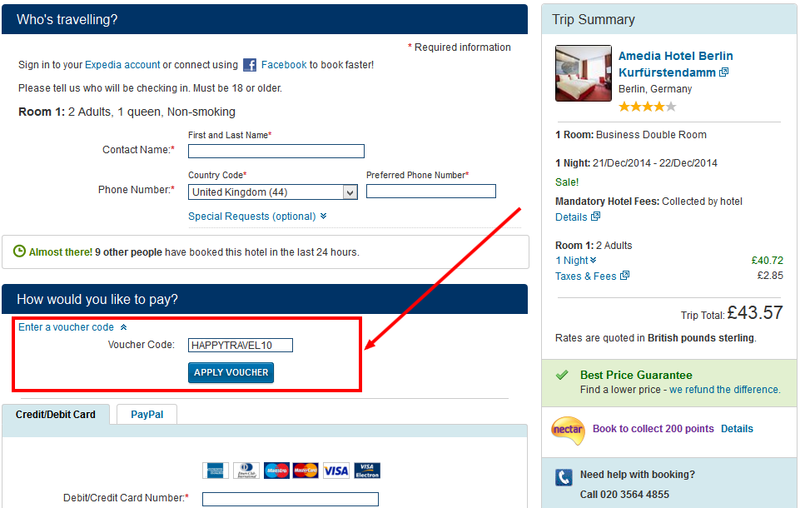 10% Zuji Australia discount code for hotel bookings in Europe (no minimum spend, travel throughout 2014). Zuji Singapore offers a 80 Singapore Dollars discount code for hotels worldwide (travel until 30 June 2014). The best thing about this coupon code is that it seems to be valid also for large international hotel chains (we tried with a Hilton in Rome and it worked). The discount is valid for purchases of minimum 450 Singapore Dollars. The prices will be quoted in Singapore Dollars, so use an online converter to know the value in USD or EUR. The Zuji coupon code must be applied in the payment window, in the field "Promo code", just above the credit card information . The Hilton Garden Inn in New York near the Central Park it's a brand new hotel that will be open starting with 27 January 2014. To celebrate this event, you can benefit of 40% off the regular flexible rate, by booking a special rate negociated by Travelzoo. The rooms are to be booked directly on the Hilton website. Each day until 21 September there is a specific location on sale. The promotion is valid for car pick-up until 1 November 2014. 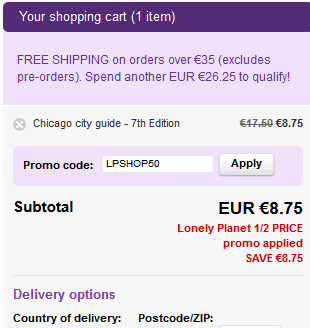 The discounts are automatically applied, so there is no need for a voucher code. Hotels4U.com (part of Thomas Cook group) has a £30 discount code on hotel reservations made until 13 January 2014 (for stays well into 2015), with a minimum value of £450. The discount is already embedded in that link and will be automatically applied - there's no need to manually type in the Hotels4U.com voucher code. The offer is valid at certain hotels at a time, probably depending on their surplus of available rooms (no discount code needed). The list of hotels taking part in the offer is changing, so you need to check if your preferred hotel offers the discount during your travel dates. The rates are non-refundable, so book only if you are sure of the itinerary. The upside is that they are truly offering a 40% discount. For example, two nights (14 - 16 February 2014) at the Movenpick Frankfurt Oberursel**** have a total price of € 108 (that is € 54 per night, breakfast included). The same room costs € 215 on booking.com. Club Carlson is the loyalty programme of the Radisson properties and its sister brands (Park Plaza, Park Inn by Radisson and Country Inns and Suites By Carlson). For 3 nights stayed until 13 April 2014 you get 38 000 points that you can afterwards use to book free nights at Radisson properties. The 3 nights are taken into account in one or more stays (so it is not mandatory to book a consecutive 3 night stay). The promotion is valid only for members of the Club Carlson loyalty programme. If you are not yet a member, you can register for free using the link below. They advertise this promotion as a stay 3 nights and get 1 free (by using the 38 000 points). However, depending on property and location, the 38 000 points can actually get you 3 nights for free (for example, the Radisson Blu in Budapest, Hungary, goes for 9 000 points per night). Let us know how this promotion worked for you. Offer at the Wellton Terrace Hotel**** from HRS Deals, at 25€ per night, including breakfast, to be booked by 10 January 2014. Offer valid for stays until the end of March 2014. The deal is valid on the German website of HRS. However, on the top right corner of the window that opens, you can easily switch the language to English. Thistle hotels is a chain of quality hotels spread out throughout the UK. They are currently promoting special prices for bookings made via their official website. These rates start at £ 50 per night and include breakfast. They are non-refundable, so book only if your itinerary is certain. For example, a room at the Thistle Liverpool City Centre - Atlantic Tower**** has a total price of £ 55 for the night of Saturday, 25 January. The same room is sold at £138 by booking.com. These indications are based on our own research, as well as other travelers' reports on various forums. Guest Score: Rated 8.0 out of 10 (or higher).Guest favorite. Guest Score: Rated 8.0 out of 10 (or higher). Guest favorite. Guest Score: Rated 7.0 out of 10 (or higher). Guest favorite. Guest Score: Rated 9.0 out of 10 (or higher). Guest favorite. The special rate offers at least a 15% discount compared to the lowest regular advance purchase rate. Write a comment to let us know how this special rate worked for you. For stays throughout the year 2014, Hotelopia (part of TUI Group) offers a 9% promo code for hotel stays worldwide.